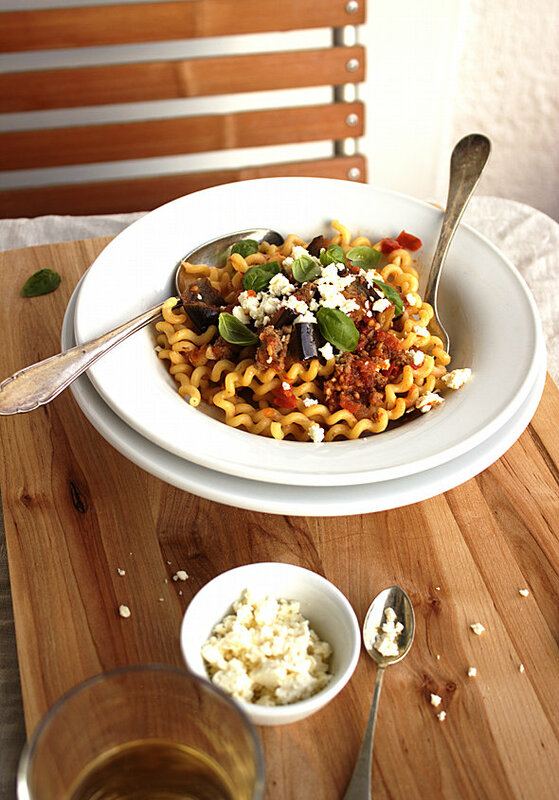 Popular Italian Bolognese ragu meets popular ingredients in the Greek kitchen such as eggplants and feta cheese combined with a subtle touch of cinnamon in this Mediterranean fusion cuisine. Spaghetti (alla) Bolognese is widely popular around the globe and often perceived as a typical Italian dish. Funny thing though is, that Italy of all things happen to be the only country where spaghetti is actually not served along with the ground meat based sauce (to be honest I didn’t know that until now that I’m writing about it). The reason for that is that spaghetti is lacking the substantial ‘meat sauces adhere well on it’ attribute. Tagliatelle is usually the classic pasta in Italy that gets the privilege to be dressed with Bolognese ragu. I for one know, that my next pasta Bolognese will be made with tagliatelle. Alternatively pappardelle, fettucine or short tube pasta such as rigatoni or penne are also acceptable. For the meat usually minced beef is used. Also typical for Bolognese ragu is mirepoix which stands for the vegetable trio of chopped celery, carrots and onions. In more contemporary recipes milk is also added, as is wine (red or white). Tomatoes in any form and state of preference are actually considered an auxiliary ingredient. In contemporary recipes around the globe tomatoes however are a basic ingredient. When it comes to non typical ingredients the second big surprise besides the preferred pasta shape that this sauce has in store is waiting. Garlic, that offers so much flavor and intensity and seems apparently very popular in Italian cuisine is actually not part of the classic version. Yes, that really is the case. The bulbous plant is actually not part of Bolognese in authentic recipes. To quote cooking authority Marcella Hazan, the late acclaimed Italian cookbook author who played an important role in making classic Italian cuisine popular in the US. Her first cookbook The classic Italian Cookbook was published in 1973 when she was already in her early fifties. Comparisons with Julia Child weren’t afar who as an American chef is considered one of the major influences to make the French cuisine popular in the US with her TV shows and cookbooks. When looking behind the common belief that garlic is frequently used in Italy you can see that there are actually a lot of Italian dishes that don’t use garlic. Also that there are two camps regarding the bulbous herb. One, that are firm believers in garlic and the other one, that truly despise it for its pungent flavor and bad breath it can cause as an unwelcome side effect. Silvio Berlusconi, former prime minister of Italy, is notoriously known (among other things apart from his impressive accomplishments) for his aversion for garlic. Well, actually there are three camps with the third one being in between “following” Hazan’s guide. 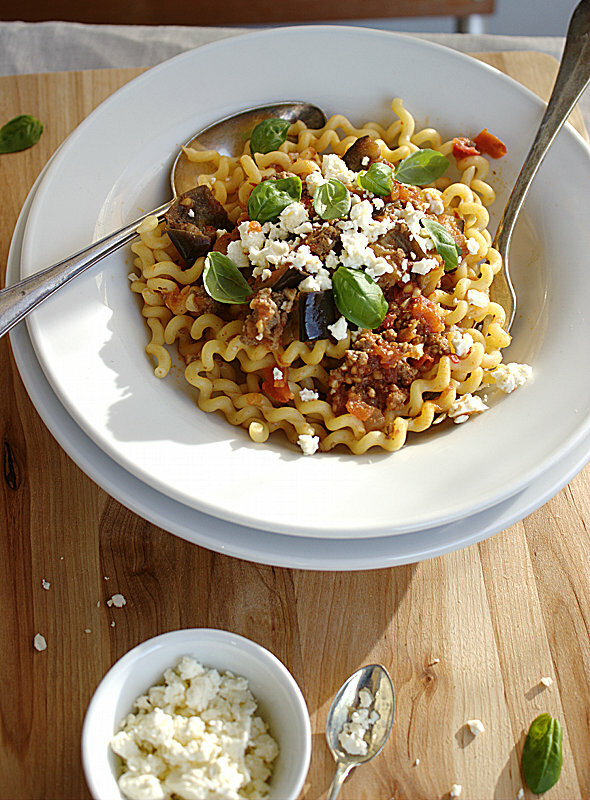 One of my inspirations for a Greek influenced Bolognese came from one of my brothers. He once cooked for our family Spaghetti Bolognese in dedication of his latest occupied bachelor pad and to my little pleasant surprise included some feta cheese in his sauce. I always was fond of eggplant in Bolognese variations. Together with being lately intrigued in general by fusion cuisine it was just a matter of time for this Mediterranean hybrid recipe which also does include some minced garlic. The use of eggplant along with spices like cumin and cinnamon are reminiscent of the Greek Moussaka. 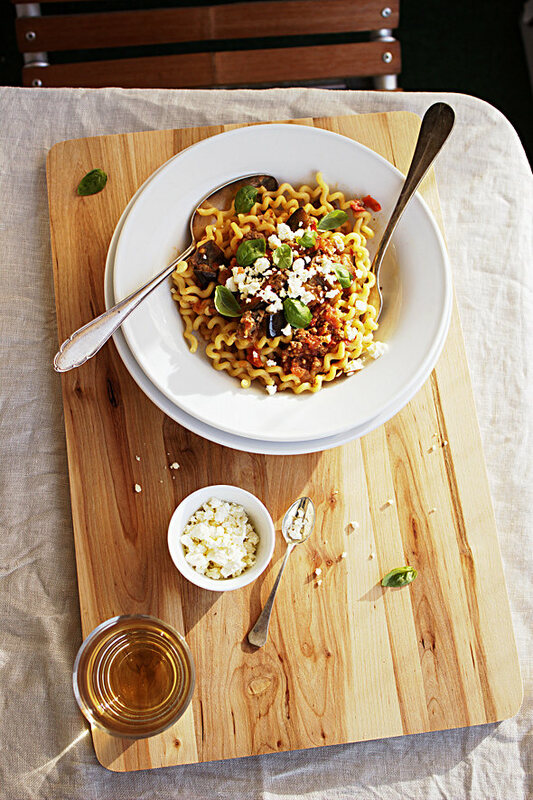 Popular Italian Bolognese ragu meets popular ingredients in the Greek kitchen such as eggplants, cumin and feta cheese combined with a subtle touch of cinnamon in this Mediterranean fusion cuisine. Preheat the oven at 230°C (450°F). Season the eggplants with salt, pepper and cumin (no need to add oil). Once the oven is preheated spread the eggplants on a rack lined with parchment paper and roast them for about 30 minutes or until cooked through with caramelized edges. In the meantime slowly bring a big pot of water (about 3l) to a boil at medium heat. Add 2 TS olive oil in a wide pan and heat up at medium high then add the mirepoix / holy trinity (diced celery, carrot and onion). Season with salt and pepper and stir occasionally for about 12 minutes or until they soften up and develop some color. Adjust/lower the heat if necessary. Then transfer the sautéed vegetables on a plate. Add 2 teaspoons of olive oil in the empty pan at medium high and add ground meat to brown it. Flatten the meat to expand the browning surface area and let it develop some color before flipping it on the other side. After that break the meat in small pieces. Season with salt, pepper, dried rosemary and paprika. Once the meat has overall changed its color add back sautéed vegetables and stir everything together until combined. Now add in tomatoes, season with salt, pepper, dried oregano and a pinch of cinnamon. Bring the sauce to a gentle boil then simmer everything for at least 30 minutes (better 45 minutes). Stir occasionally. In the meantime when the pasta water comes to a boil, add 2 teaspoons salt and the pasta. Stir well to avoid the pasta to stick together (especially at the beginning). Cook until the pasta becomes almost al dente (a good one or two minutes prior). Drain and reserve some of the starchy cooking water (about ¼ cup / 60ml). Drizzle some olive oil on the roasted eggplants and combine them with the sauce. Pour some of the sauce over the pasta in the pot and mix to combine. Add some of the reserved pasta water. 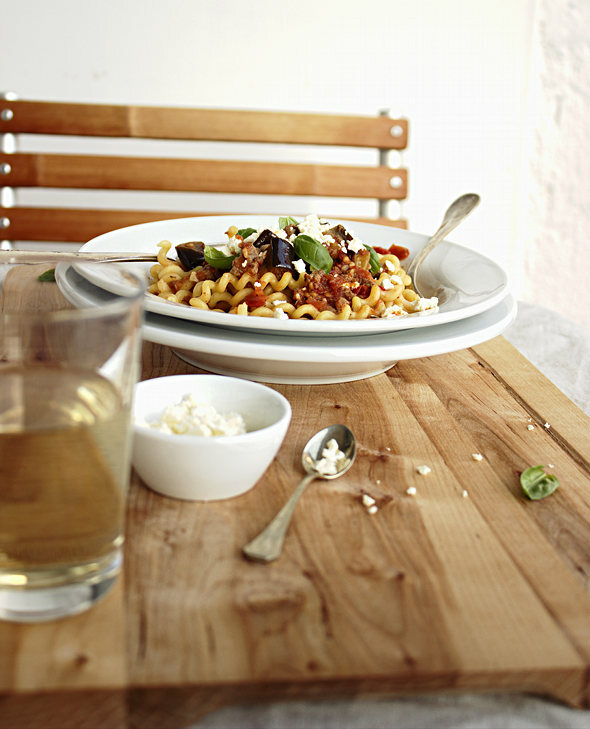 To serve add the pasta on a plate, pour some more sauce over and top it with some crumbled feta cheese and basil leaves. Whenever roasting vegetables I’d prefer to add olive oil after the roasting is finished. This way you avoid heating up the olive oil that naturally doesn’t have a high smoking point. I have noticed you don’t monetize your page, don’t waste your traffic, you can earn extra bucks every month. A food-centric blog with omnivorous (mostly) health-conscious delicious fun-endorsing recipes – full of twists, love for details, hacks and tricks.